Late Christmas present to Me. I just got this the other day. This will help a lot on my travels. My last set a Fiio X5 and RHA T20 where stolen from my car when a low life got a hold of My carry on bag. The Sony sounds great not as powerful as the X5 but will do the job. I remember when you posted up about that smash 'n grab! Curious, why didn't you go with the same setup again? Are the 425s a step up? @Irrenhaus be good to yourself. "If there are not tunes in heaven, I shall not go!" I just to have a set of Shure's ear bubs. 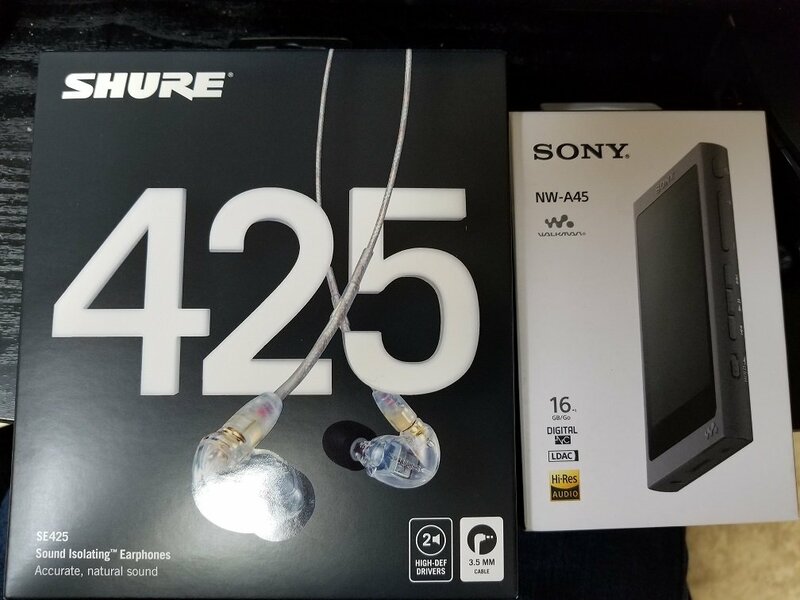 Between the RHA and SHURE sound quality is about the same but the Shure have a better fit and comfort, specially on very long flights 10+hrs. Nice. I have a pair if 530s I use for biking. Been looking at new players to replace an ancient Sony. Any cons to the A45 I should be aware of? Only one so far is not as powerful as the Fiio X5. But sound quality is good. Will test more today during my trip.